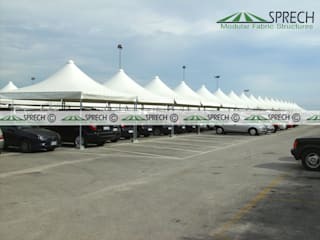 SprechIndia.com a joint venture with Sprech, Italy is backed with over 30 years of experience in the field of modular fabric structures. We custom design, manufacture, and fit canopies and walkway solutions for schools, councils, commercial and domestic customers. We offer a comprehensive experience taking our customers through site surveys, bespoke design and a full fitting service. 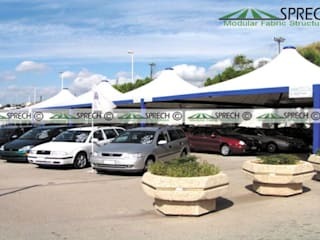 SprechIndia is an Italian based ISO 9001:2000 certified Company in field of Tensile Fabric Roof Structures since over 21 years. 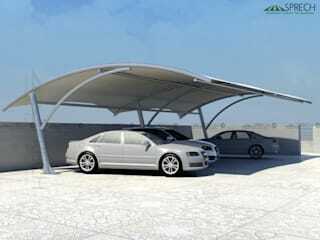 We are premier manufacturers of pre-fabricated structures, tents for event, vehicle parking shades, waterproof canopies for resorts, hotels & restaurants, temporary storage's, industrial shade structures and outdoor open area that requires covering from humid temperature.